The 26th of May is the day the Church remembers and celebrates the Venerable Bede, who died on that day in 735 (This year we celebrate him on the 25th, as the 26th is Trinity Sunday!) Bede was a Saint and Scholar, whose wonderful Ecclesiastical History of the English People, is still the major source for early English History, as well as being, in itself a deeply inspiring book. 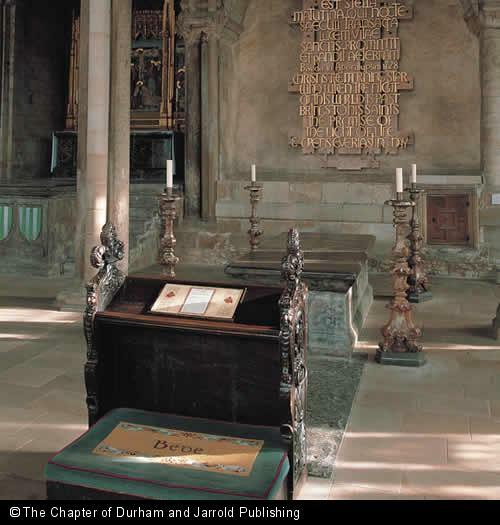 He is buries in Durham cathedral and set above his tomb, in beautiful shimmering letters is the text of one of the prayers he wrote. 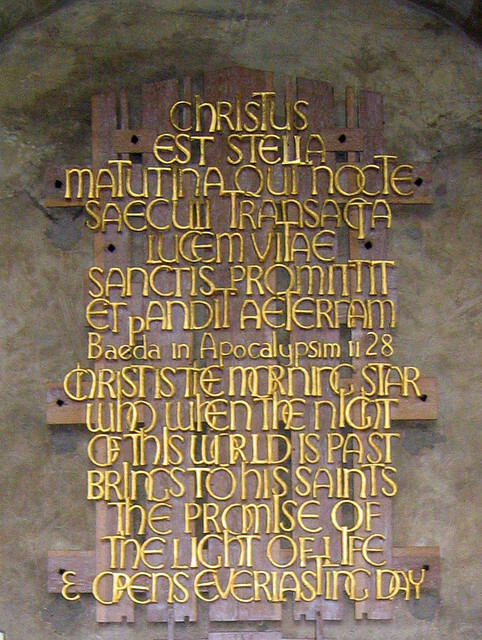 My sonnet in celebration of Bede draws on this prayer so I give its text here in both Latin and English and have posted a photograph of it below the poem. …”a revelation gleaming on the shards of all of our broken lives and promises…” Amen ! Thank you, Malcolm, for your exquisite, faith-affirming poem. And what great thanks we owe to The Venerable Bede for his lines that across the many gloomy centuries reflect the promises of Our Savior into this modern, semi-godless world. I have visited Durham Cathedral once before, and I plan to do so again, before I depart this earthly life. And when I find myself there, kneeling at Bede’s grave, I shall place two little flowers: one from me and the other from you. Thanks You! Long time ago my oldest daughter sent me a postcard, with these words over the grave of Bede. I have framed the postcard and often I read and reread the words. Thanks Coby. I also have that postcard with these words over my desk!